Your personal branding statement communicates what you do and why you do it in the most vivid terms possible for those that want to learn more about you as a professional. It's a critical part of building your personal brand, and today we've created a special infographic to help you create your own personal branding statement. The Anatomy of the PERFECT Personal Branding Statement. You can't assume people know who you are, what you do or where you work. Tell them right away. Your personal branding elevator pitch describes what you do while incorporating your most valuable skills. Make sure you go back and learn how to create your elevator pitch if you haven't already done so. This section is reserved for a passionate reason or reasons why you do what you do for a living. Be emotional. Be broad. If you can't think of something big that inspires you to go to work each day, you might be in the wrong job. What type of folks do you want to meet to help you further you along your professional path? And towards what purpose do you want to build as you collaborate with the people around you? This easy four-step format is a simple, yet effective way to paint a compelling picture of who you are as a professional. 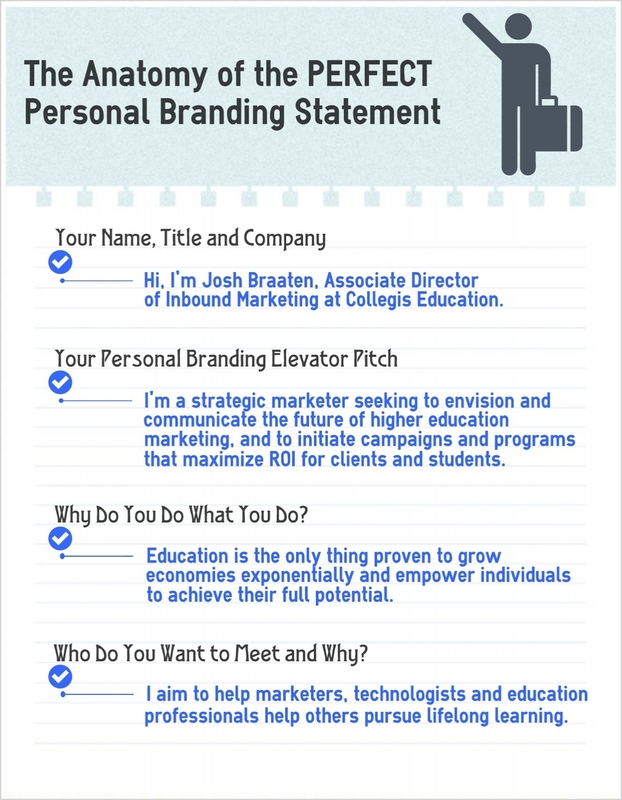 Take a few minutes to create your own personal branding statement using this handy new infographic and blog post as a guide. Be sure to share what you come up with by way of a comment below.